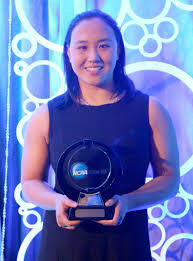 In October,¬†Margaret Guo was named the NCAA Woman of the Year. The award was in recognition of her accomplishments not only in the swimming pool but for her academic work as well. She is the first MIT student to win this award. Margaret graduated with dual degrees in electrical engineering and computer science and biological engineering. While working on her degrees she also competed on the school‚Äôs swimming team. Her events were the 200 freestyle relay, 400 freestyle relay, 200 medley relay and the 400 medley relay. Working on dual degrees and competing in athletics was a challenge for Margaret. She had this to say about the workload: ‚ÄúIt was definitely a tough experience in terms of trying to balance the rigors of athletics and academics at the same time, but I think that my biggest achievement at MIT is learning how to think like a scientist‚Äù. Margaret was just as dedicated to her academic work as she was to swimming. Margaret was a researcher at MIT’s Centre¬†for Gynepathology Research. She also co-authored two academic papers. Throughout her time in MIT she was a member of the school’s Society of Women Engineers. In her senior year she served as president of the society. Speaking about the work that they do she said: “The goal is to inspire younger generations of women to go into STEM fields, which historically have a lack of women representation”. Margaret has moved to Stanford where she is working on her doctor of medicine and doctor of philosophy.